The series of 12 Questions interviews continues with Ricky Stenhouse Jr. of Roush Fenway Racing. These interviews are recorded as podcasts, but also transcribed on JeffGluck.com for those who would rather read. I don’t dream very much. Well I’m sure I do, but I don’t actually remember them or wake up and be like, “Oh wow, that was crazy.” When I was younger, I used to dream quite a bit around racing. Now that I do it for a living, maybe I don’t dream about it as much. I always feel it’s necessary to apologize if it’s an accident. I’ve gotten into people on purpose and I definitely ain’t calling them if I feel like they deserved it, right? So I’m not apologizing. That’s the way I roll. So there’s no fake explanation later where you’re like, “Oh, I really didn’t mean to do that” even though you did? You just don’t bother. Throughout my racing career, I always loved when people are like, “I love how aggressive you drive, on the edge,” because I feel like that’s my driving style. So I like it when people feel like I do that. And get the most out of the car. I feel like that’s always a positive compliment you can get as far as driving a race car. Probably Alan Jackson, that’d be cool. I feel like there’s a lot of cool sports celebrities and people that come to the track that you get to meet, but I feel like Alan Jackson doesn’t do a whole lot outside his (singing), so I think that’d be cool. I would think so. His music and him scream NASCAR, so I don’t know. That’s who’d I want to come hang out with me. I wish I could have hair like he did, especially in the 90s. You almost did for a little while. Yeah. I might try and get it again, but I don’t know. I mean, long blonde hair is pretty solid. Who says vegan’s healthy? There’s people that say you need to eat some meat, right? Protein. But for a No. 1 pit stall, it depends on what track they would give it to you at. I would definitely do it for pit stalls where it feels like it’s a huge advantage, a track position racetrack. So I’d probably do it. I quit eating candy for a month one time, and I feel like that was probably harder than going vegan for a month. 6. It’s time for the Random Race Challenge. I’ve picked a random race from your career and you have to tell me where you finished. Are you good at remembering races or no? I’m OK, but I don’t know. After so many years, I feel like they run together. Do you remember where you finished in the 2014 Bristol night race? That was the year before, I think. No, that was the first race (that year)! When we raced at night (because of a rain delay). So we finished ninth? Well I don’t remember that one then. You started 21st, you finished sixth. I do know that we don’t qualify good there, or we didn’t. We did this year. You actually started 21st in that race where you finished second as well. Yeah, so that threw me off, because we ran like four night races in a row, I feel like, at Bristol, because of rain. So that was a trick question. You finished behind Kurt Busch and ahead of Carl Edwards in this race. Do you remember racing them at all? Yeah, that one’s kind of a blur. Now the spring race of that year, I remember. Carl won, we finished second, it was raining like two laps to go. That would have been too easy though if I was like, “Oh, second.” It sticks out. I had to make it somewhat hard. No, that was good. I like that. That was cool. Has anybody for sure guessed it? Yes, some people have totally nailed it out of nowhere. I don’t really think any rappers are good. I like Colt Ford, he’s solid. Is Kanye West considered a rapper? I’ll go with Kanye West. I could not tell you a song that he sings, but we’ll go with Kanye. Oh, I remember this question. I told (Kyle) Larson I was doing this when we were watching sprint car races last night. That’s right, he picked you (in the 12 Questions earlier this year). Yeah, he said me because we actually did (punch each other) at Knoxville last year (explained here). I really think any face is punchable, just depending on what they did. Like if somebody crashes me and they want to come up and complain to me about why we got in a wreck, I’d probably do that. It just depends on how mad I am. I mean, there’s a few that you would punch and then run the other way. I don’t know how people would fare with Newman. I don’t think very well. Yeah, I don’t know. You might want to get five hits in real quick. But you gotta be ready to take another one. Oh wow. I’d probably put Tom Hanks as my spotter; I feel like he’s somebody I’d want to listen to. I feel like he probably has pretty good ideas of what’s going on. I feel like LeBron would be a good crew chief, just because I feel like he basically coaches his teams now from the court. So I feel like that’s what a crew chief does. And so I guess Taylor will be driving my bus. Hope she can cook. I doubt she cooks, but I don’t know, maybe she does. She probably has people who do that. Yeah. Well as long as she can bring those people. Pre-race bathrooms are a necessity. I think (car chief Scott) Brewer here, he helps point them out for me. He scouts them out for me. I’ll get to the car after intros and he’s like, “Hey, nearest one is over here or over there.” So that’s the way we roll over here on the 17. But it’s kind of tricky. At the 600, our cars were on the racetrack (instead of pit road before the race). They got done with the national anthem and I was like, “Man, I’ve got to go to the bathroom.” I had to run all the way across the grass into basically the media center, go to the bathroom and run all the way back out. So you probably were breaking a sweat already before you got in the car. Yeah, I was definitely getting warmed up. But even if you don’t have to go to the bathroom, you go to the bathroom just to make it easy. Like I had to pee at Pocono on Lap 10, and I just was miserable. Well, I haven’t tried a backflip in a while, but I used to be able to do a standing back tuck on the ground without jumping off the car. I used to give Carl a hard time when he was here at Roush; I was like, “You can’t do them on the ground? You do them off the car?” But I haven’t done them off an object other than into pools and stuff. I used to be able to do them just standing on the ground. Maybe I’ll send you a video. I mean, I would take any kind of money. But I don’t really care because that means we won the race, and that’s really all I need. Probably a Bristol night race would be cool. I might try it there. Try it. I might leave my helmet on. 12. Each week, I ask a driver to give me a question for the next interview. Last week was Jamie McMurray. He said that you and Clint Bowyer used to gang up on him and make fun of him for working out, things like that. He noticed that you now work out a lot and it’s a part of your lifestyle. So he wants to know, what changed in your life that made that important to you? And then after that — I’m not superstitious, but there’s times like last year where I’m like, “We’re running good, guess I’m not going to work out. I just can continue to play golf and race.” And so that’s what we did. But then this offseason I got with PitFit training in Indy. They do a lot of IndyCar drivers, a lot of (NHRA) Top Fuel drivers, some sprint car drivers work out there. But it’s more race car driver based, a lot of the workouts that they’ve got me doing and things like that. You know, reaction time, hand-eye coordination when your heart rate’s really high, things like that. So I’ve been enjoying doing that over the last probably month and a half. I don’t know who the next interview is going to be with. Do you have a question I can ask another driver in the garage? I think you should ask your next driver if they would be game to have a Wednesday night race, like a one-day show, at Bristol once a month. Like a side series or part of Cup? Like part of Cup. Just go in there, kind of like a (local) short track race. Like you have an hour of practice, then qualifying, then race that night. Do it all in the afternoon and night. I’ll see what the driver’s poll is on that. Because I really would like to run Bristol every other week. Yeah, I can see that based on your results. Yeah, every other week let’s go there. It’s amazing how much you can learn about a driver in less than 15 min. Richard Lynn “Ricky” Stenhouse Jr. (born October 2, 1987) is an American professional stock car racing driver. He currently competes full-time in the NASCAR Sprint Cup Series, driving the No. 17 Ford Fusion for Roush Fenway Racing, and part-time in the Xfinity Series, driving the No. 60 Ford Mustang for Roush Fenway Racing. Stenhouse was the 2010 Nationwide Series Rookie of the Year, and won back-to-back Nationwide Series championships in 2011 and 2012. 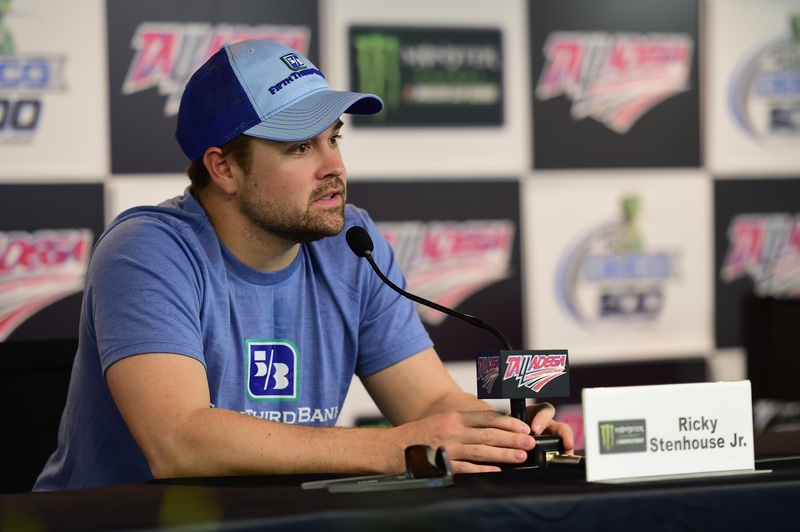 Stenhouse was the 2013 Sprint Cup Series Rookie of the Year.